New Year. New You. 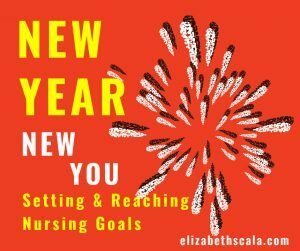 Setting & Reaching Nursing Goals. Happy New Year to everyone here reading! Gosh, another year is about to start. This can mean so many things for nurses and nursing students. A chance to reflect. The first thing I like to do when starting out with something new- is to look at how far I have come. If we only focus on what is ahead, we can set ourselves up for terrifying overwhelm. A surefire way to burn ourselves out! So… first things first. Look backwards before setting your goals. What did you accomplish last year? Where have you grown as a nurse? What are you proud of? Or what did not go so well that you learned from? A chance to take pause. Once you take the time to look backwards over previous years of your nursing career, you can turn to the present moment. Take a look around your current nursing job. Are you happy? Do you enjoy your work? Are you able to use your unique talents and skills? Or is it time for a change? Be honest about your current situation. A chance to set goals. Past and present accounted for- now it is time to set some nursing career goals. Where would you like to be at the end of this year? In three years? Five years? Ten? Are there any educational programs you need to take to reach your goals? Do you need to find and reach out to a nurse mentor? Write down actionable goals in small steps. Think about what you need to do today, this week, and this month to reach your end goal. Do one thing at a time in order to stay on track. Over the past five years or so I have put out a lot of content for nurses and nursing students related to nursing careers and setting goals. Whether it be an audio, video, or piece of writing- I have shared several tips and strategies along the way. In addition- I have interviewed and learned from some exceptional nurse leaders myself! Goal setting in the New Year. A practical set of strategies to help you think about your nursing career goals… and how to reach them! Go for it! A podcast interview with Fran Medina that teaches us how to define and focus our career goals… so that we enjoy success! Proactive Planning. A way to reassess goals and ensure that you continue to reach your targets! 12 Tips for Self-Care. A dear colleague, Amy Z. Rowland, shares with us on how to take care of ourselves as busy nurses. What better way to continue to care for our patients in this upcoming year… then to ensure we come from a healthy, energized self! So… what did we miss? Let’s hear from you! How do you set and reach your nursing career goals? What is on your plate for this upcoming year? Thank you for the resources, very helpful. I have been reflecting on 2016 and working on setting goals to change the things that didn’t wotk last year. You’re so welcome. Glad you found them useful! Oh, so good to hear. And I can always hear it back from others… helps me take my own advice, LOL. Glad you enjoyed the post. Thanks for stopping by and sharing your thoughts.